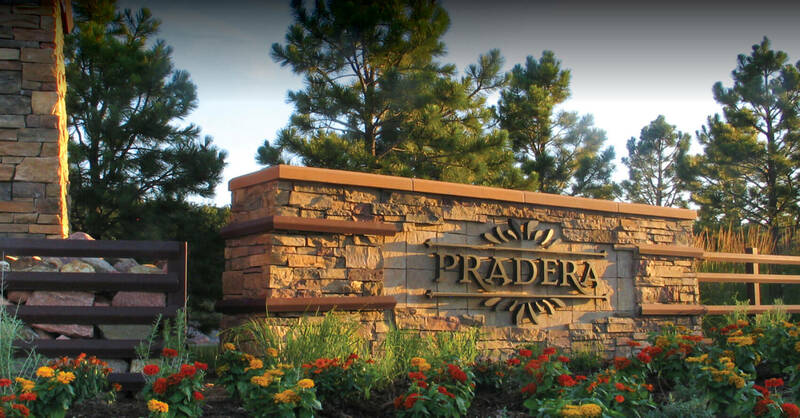 Pradera is a master-planned community that balances its peaceful prairie setting with its close proximity to every necessity and plenty of things to do in the Castle Rock and Parker area. The Denver Tech center is less than 25 minutes away. Highly respected Douglas County schools are only a few minutes away, as are some of the region’s best shopping, dining and entertainment venues and events. Our sales office is located at 4600 Wildgrass Place, Parker, CO 80134. Click here for a Google map. Take I-25 south to the Founders Parkway exit and go east 1.6 miles to Crowfoot Valley Road. Go north on Crowfoot Valley 3.4 miles to Pradera Parkway. Go right on Pradera Parkway and follow signs to the sales office. Take E-470 (toll road) south to Parker Road. Go south 5.6 miles from Main Street in the town of Parker to Bayou Gulch Road. Go west (right) on Bayou Gulch 1.5 miles to Pradera Parkway. Go left on Pradera Parkway and follow signs to the sales office. Take I-25 north to the Founders Parkway exit and go east 1.6 miles to Crowfoot Valley Road. Go north on Crowfoot Valley 3.4 miles to Pradera Parkway. Go right on Pradera Parkway and follow signs to the sales office. Questions? Give us a call at 720-851-9411.